The audit was released Thursday. 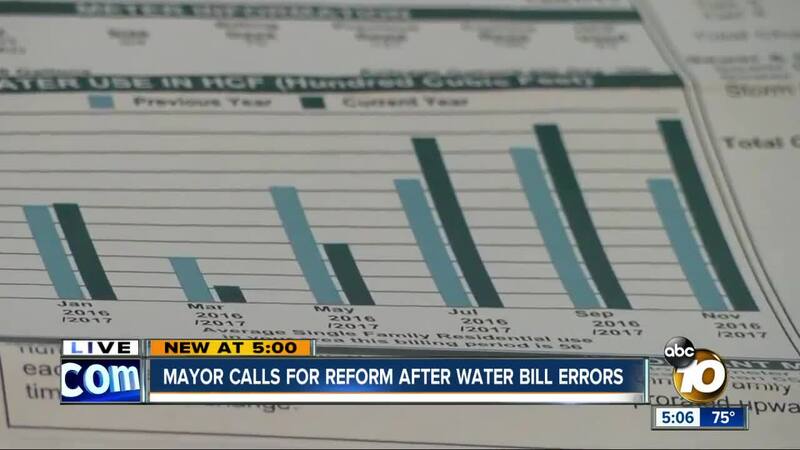 Thousands of San Diego families got erroneous water bills in the mail over the last year largely due to human error, according to a new city audit which has Mayor Kevin Faulconer calling for more oversight. The audit, spearheaded by city auditor Eduardo Luna, came after hundreds of residents came forward with complaints of mysteriously high water bills, and an admission from the Public Utilities Department that 300 residents in four neighborhoods - Rancho Bernardo, Rancho Penasquitos, Mira Mesa and Carmel Valley - got false bills due to human error. The city terminated that meter reader. The audit, released Thursday after months of work, said overall human error caused about 2,750 bills to reach homes in the city. Luna said one meter reader entered false information intentionally, but others simply made mistakes. The readers are charged with walking neighborhoods, documenting hundreds of meters a day using a handheld electronic device. Some meters are covered in dirt, scratched, or inaccessible altogether. The audit says the handheld meter devices have a warning system to alert readers that their entry is out of range. It is supposed to lock after three unsuccessful attempts to enter meter reader values. But the audit says meter readers knew how to circumvent this. After a cluster of high bills in December 2017, a city investigation found that one meter reader entered false data, causing 625 of the erroneous bills to be mailed. "While PUD (Public Utilities Department) only identified one meter reader, the controls may have been circumvented by other meter readers as well," the audit says. The audit found ten meter readers accounted for more than half of the readings corrected before billing and 71 percent of re-billing for 2017. Luna said the audit department looked at 1.3 million bills issued in the city in the last year. Overall, his audit found the Public Utilities Department flagged 57,000 bills for review. Of those, 18,700 were corrected before being mailed out. But 2,750 of erroneous ones did reach mailboxes. Overall, the error rate was about 1.6 percent. Luna added that 21,000 households had doubled their usage. The audit also focused on communication and customer service in the department. Luna said the city did a poor job of communicating that rates were increasing and that one billing period would be longer - leading to higher bills for that cycle. Luna said the auditors would be doing deeper dives into the Public Utilities Department, including one on the city’s automated water meters. That could come out toward the end of summer.